Lee Cockerell suggests that leader’s should apply this wisdom to their employees, as, like any good parents, good leaders prepare their people to take on future responsibilities by providing appropriate educational opportunities and exposing them to important developmental experiences. As the name of this strategy suggests, this is all about how you enhance the capabilities of your people through continuous development and growth opportunities. 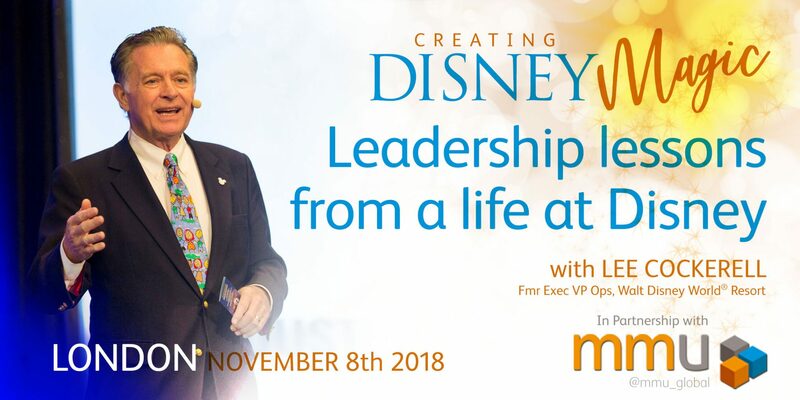 In this next stage of our summary through Lee’s book, Creating Magic’, we’ll explore what Disney actually does to demonstrate how seriously they take employee development; “Training and development permeate every level of the company; they are the primary reason the Disney brand is the synonymous with service excellence”. The Vision Statement: What We Want To Be – Disney World will always be dedicated to making dreams come true in this magical world, fantasies real and reality is fantastic. A wonderful sense of community awaits where are greeted as welcome guests who become cherished friends. For all who work and play here, Walt Disney World will be a source of joy and inspiration. The Essence Statement: What We Want Our Guests To Feel – Walt Disney World is a magical passage into a world of fantasy and adventure. Here we can wish upon a star, experience the impossible and bring our dreams to life. Together, treasured friends discover a wonderland that dazzles, delights and renews through all the seasons of a lifetime. The Mission Statement: What We Must Do. Our mission is to honour our heritage and continuously reinvent Walt Disney World. Lee created a simple purpose statement for his Ops team at Walt Disney World “Make sure that every Guest has the most fabulous time of his or her life”. This sentence tells Cast Members exactly what the ultimate outcome of their work must be. He’s realistic about how much many team members will actually remember; indeed he says that many cast members will not even be able to recite his one line purpose statement verbatim! But, thanks to constant reinforcement from leaders who walk their talk, they do all internalise the meaning of every word. Give people a purpose, not just a job – Don’t just give your people tasks to do; inspire them with a higher sense of purpose. Studies have shown the primary reason businesses lose customers is not inadequate products or services but the way they treat people. Lee tells us that Disney places considerable emphasis on providing staff with detailed knowledge about the products and services they offer. 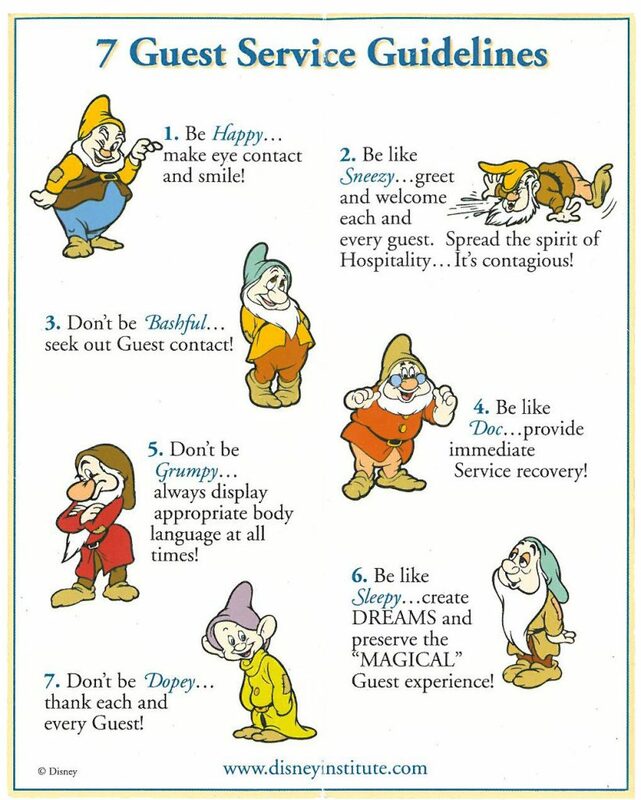 “If you eat any Disney restaurant, you’ll find that every server knows every ingredient in every dish on the menu. This has advantages beyond enabling him or her to answer all the questions from diners. For example, if you say that your child has a certain food allergy, the server will bring the Chef to your table to consult with you about how they can prepare a safe meal for your child. Because of that special training, many parents of children with food allergies come only to Disney resort for vacations. This same product knowledge focus extends to wine; where about a quarter of all certified sommeliers in the US, work at Walt Disney World, (which sells more wine than any single site in the world). Of course, informal learning is emphasised alongside formal learning activities too. C – Care – show your team you are interested by focusing in on individual development. Talk to them every day about Excellence and show you are committed to them and it. O – Observe – close observation of the workplace will tell you what needs to be improved. Take note of behaviours being demonstrated, as well as activities and tasks being undertaken. A – Act – take action, make the decision, NOW. Don’t procrastinate, solve the issue straight away. C – Communicate – the best teachers are great communicators, who get and hold the attention of others. H – Help – use your leadership position to support others to become better themselves. Show people how to perform tasks properly; be crystal clear about your expectations for performance, attitude, and behaviour; and enforce the rules, policies, and operating guidelines. Take your role as a teacher seriously – Earn a reputation as a good teacher, and people will line up to work for you. Who the teacher is, is just as important as what is being taught. Train people for Magical Moments and 5s – At Walt Disney World, Magical Moments are planned events designed to engage Guests and enhance their experience. For example, every morning a family waiting in line for the the Park to open is chosen to officially open the Park for the day, with their children asked to make an announcement to everyone that Walt Disney World is open! Take 5s are more spontaneous. Cast Members look to seize opportunities to do something special for Guests. For example, replace a spilt ice cream for free, asking a little girl dressed like Cinderella for her autograph, telling Guests unusual facts about the Park. These are called Take 5s because they blow the Guest’s minds in less than 5 minutes. They may seem random ‘acts of kindness’ but Cast Members are trained to look for them and are held accountable for making them happen. Of course, most Take 5s take closer to 5 seconds than 5 minutes! Don’t fall into the trap of thinking that management needs to identify what these Magical Moments and Take 5s need to be, your team members will know exactly what they can do to enhance the customer experience. Pre-Shift Meetings – just 10 minutes a day to prepare and organise the shift adds up to 40 hours of training a year! But why hold daily shift briefings? Give feedback immediately and effectively – We all learn best if the gap between action and feedback is short. Make sure you offer praise as much as you provide criticism. Consider how powerful stories are in getting across your message. Don’t just tell it, explain it – whenever you introduce a new policy or procedure, describe the thought process behind it, along with relevant facts and figures. I think the emphasis Lee makes on the connection between good, regular communication and great guest experiences, is critical. Only through well informed, competent and confident teams, can Disney brand deliver on its Mission & Vision; backed up with regular feedback and praise of course!